Learning about coding is a lot of fun and we are moving along in our series. You can visit our Homeschool Unit Study for all of the posts in this series and other fun unit study posts as well. I am excited about this one as there are some very neat coding apps out there just for kids. We are now working on using apps to learn more coding, and more importantly, to learn about coding in a different way. I really like to learn about things in many different ways and with many resources. I think it is great for boys to learn in this way as there are so many ways to learn! I also think more connections are made when you approach a topic from different directions. Here you will find apps that are great for learning about coding. There are many different apps and many different age suggestions. I personally take age suggestions with a grain of salt. Use them as a guideline if you feel you would like one but don’t be afraid to have your boy dive into an app that he wants to try. Most of the selections below are iPhone or iPad only. As an Android user I can tell you that I certainly wish there were other versions of several of these games! All of these were free at the time this post was written. Hopscotch is similar to Scratch but is in app form. It is in a drag and drop format with fun creature characters to play around with. I like the look of it. Ages 8 – 12 or so. This is the free hour of code edition. Daisy the Dinosaur. Yes, her name is Daisy and yes, she is a girl dino. Very cute and a great place for young kids to begin with some simple coding to do animation. Scratch just came out with an app for younger kids. It allows kids to program their own animations and games. Scratch is really geared at 8+ so I was happy to see Scratch Jr. which is an app for ages 5 – 7 (iPad only) The game looks really neat and if you have an iPad I would suggest starting with this as it is totally free. We love free! Kodable. For younger kids 5 and up. This gives an intro to coding by having them problem solve and use logic. Lead cute fuzzy friendly monster looking avatars, the Fuzz Family, through mazes by having them follow your drag and drop commands. Free, but there are plenty of in-app purchases to upgrade—yup—wanted to let you know. Cato’s Hike (Lite). Cato goes out for a hike and discovers a portal to another world. Learn basic programming skills. Create a “map” for Cato to be able to move. Be sure to check out Homeschool Unit Study Coding Games to Play for more fun games to try. BeeBot is a simple programming challenge for younger kids. Uses directional language and programming such as forward, backward, left, right and 90 degrees. This is an interesting puzzle game that gets kids thinking logically. The developer created a game he would like his nephew to play so he could learn about programming a robot. A.L.E.X. The Foos is another totally free Hour of Code game. The Foos are different silly characters such as ninjas, builders and chefs (+others) that you program to move around and interact with each other. You have to see them–pretty cute/silly/goofy/funny looking. Certainly has boy-appeal. Your boys can also try their hand at app creation with MIT App Inventor. This site includes information on getting started, setting up your phone for testing, tutorials, and best of all, a forum for questions. These apps are a great way to learn about coding. Take the leap and try a few different ones to see which your boy takes to. Give them plenty of choices when it come to coding apps and coding in general. We have tried some that we didn’t like very much but then found others that we really enjoyed. Good thing we didn’t give up because we are having a lot of fun with coding. Homeschool Unit Study: Coding is a series so be sure to check out the other posts by clicking through the link. Would you like to subscribe to our newsletter for more fun boys’ learning resources? It’s totally free. Our posts on Boys’ Learning, Best Books for Boys all of the posts on coding, and be sure to stop by our LEGO page! Is your boy coding? What platform does he like best? 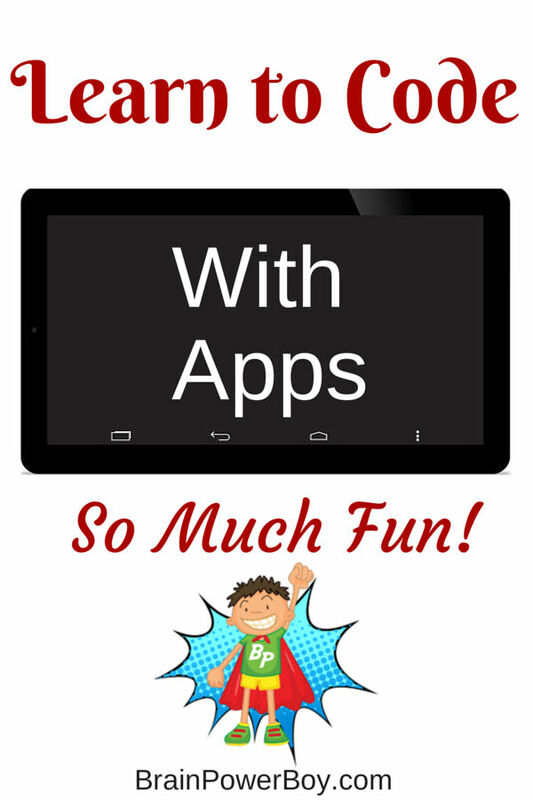 I’m excited to get my kids going with some of these apps! I will be featuring this post tomorrow at the Thoughtful Spot Blog Hop! Thanks for the feature Laura! How exciting 🙂 I hope your kids enjoy the apps. Be sure to try the Coding Games to Play as well, there are some fun ones in there. I wish I had these apps when I was a kid! I’m excited to get my five-year-old going on some coding soon. Thanks for linking up at STEM Saturday! I know, right! They are so fun Science Kiddo. There is also lightbot one hour of code that is free and really fun! Thank you so much for putting the time and effort into this wonderful list! My pleasure Emine. I’m glad you liked it.